Let me introduce you to Madalynn a.k.a Maddie. She is my oldest granddaughter and she is my precious little cupcake. She is a special little girl who we don't get to see enough but love her to the moon and back. We are so excited to have her here close to us for the summer and it has been my mission to get her to eat vegetables. I would have had an easier time wallpapering the moon. Look at those eyes, and that face, UGH, she melts me! Maddie loves meatballs. In fact, everyday she wants something with meatballs. I thought to myself, self......secretly load those babies with veggies. So I did. She almost called me out, as she was eating them she saw a TEENY TINY piece of spinach and squealed, "NONNA THERE IS LETTUCE IN HERE". ROFL I was laughing so hard. The struggle is real friends, lettuce in her meatballs, SOMETHING was fishy about this whole thing. I proceeded to watch her out of the corner of my eye, carefully inspecting each meatball before eating it. She must have eaten 15 of these things. I tried to use kid rationale before making them. Things like making them small enough she didn't have to cut into them to see any possible contraband. I used ground chicken just for a leaner alternative and we eat tons of it so I always have it on hand. 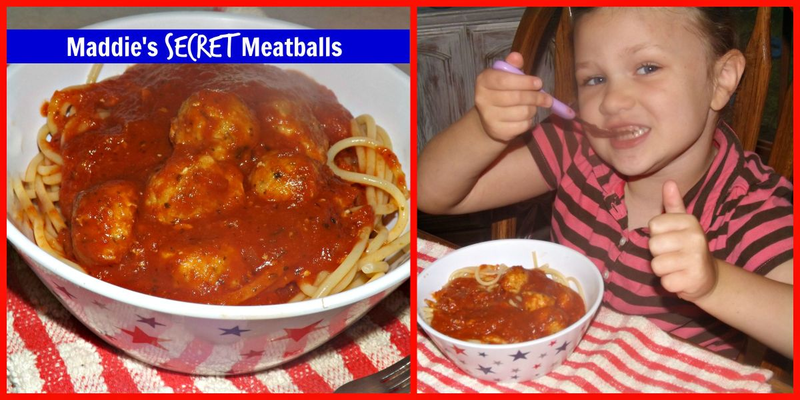 As she was eating I asked her if we should share these with other kids so their parents or Nonnas could make them her special meatballs and I got the firm thumbs up. So here they are, Maddie's SECRET Meatballs, what they don't know is in there, will be GOOD for them! I am so happy to be able to share these and my beautiful grandbaby with you all. Before you start this "kid approved because they have no idea what they are REALLY eating" recipe you will need to concoct your veggies using a food processor. Puree this until it nearly all liquid. Remember the goal is to have nothing recognizable in these meatballs. Set aside to add to your meatball mix. Combine all ingredients in a bowl. Using a tiny scoop or just your hands make little meatballs, no more than 1/2 inch in diameter. We don't want them to have to cut the meatball and risk seeing anything "suspicious". Place on a baking sheet and bake at 350 degrees for 15-20 minutes. Remove and place into your favorite marinara sauce and let simmer for a good 30 minutes so they can soak up that great flavor! Serve over pasta of your choice!